Hiya guys! Here I have the final shade for Polish Pickup and it's another that needs to be in your cart. For today I'm sharing swatches for Sassy Pants Polish December contribution to the Polish Pickup Collaboration. If you haven't heard already, this month the theme that was voted on was Holiday's Around the World. Shopping has begun so there is no time to waste, let's go ahead and get right to it. 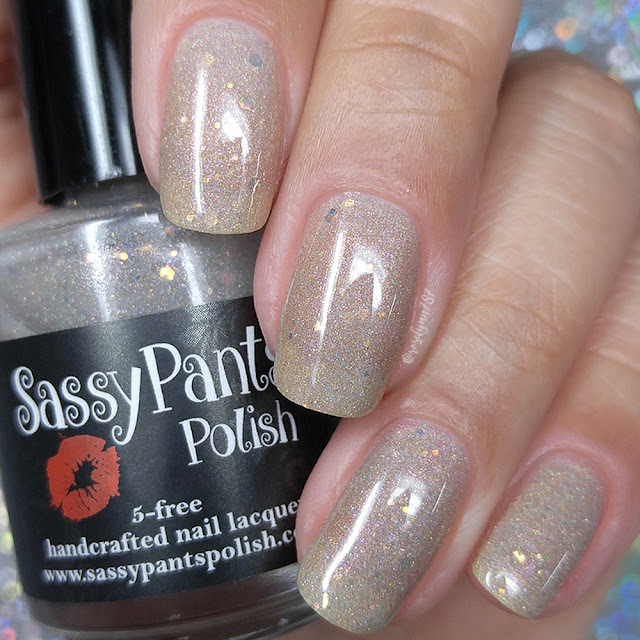 New England Christmas by Sassy Pants Polish will be available for purchase through the Polish Pickup Shop Friday, December 1st at 11AM EST through December 4th. This full-size 15mL shade will retail for $12 each. If you're not familiar with the concept, the Polish Pickup offers a fun, interactive experience that allows you to submit theme ideas, vote for your favorite theme, and selectively purchase your favorite polishes every month. As I mentioned before, the theme that was voted for December is Holiday's Around the World. This month Angie's inspiration focused on the tradition of lighted candles in the windows and white christmas lights, a fond memory from her childhood traveling from WI to CT for the holidays. New England Christmas can be described as a champagne platinum holographic polish with iridescent shifting and gold glitters with a touch of red shimmer. Isn't she perfect for the Christmas?! I love the classic holiday feel of this shade. The holo leans on the subtle side, but it has enough sparkle thanks to the glitter and shimmer. Much more than my photos could capture. 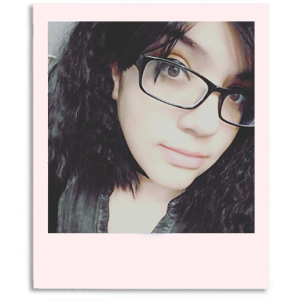 Also I like how the color looks against my complexion, though the shade does bring out a little too much warmth from my skin-tone. The formula has a sheer application and could be used as a topper as well. It builds up pretty well for almost full coverage. In my photos you can see a minimal visible nail line after some layering. Consistency wise it leans a little on the thick side and while it was manageable I did add some thinner. It dries down to a minimal gritty and semi-matte finish. Shown here in three coats and sealed with a glossy topcoat. 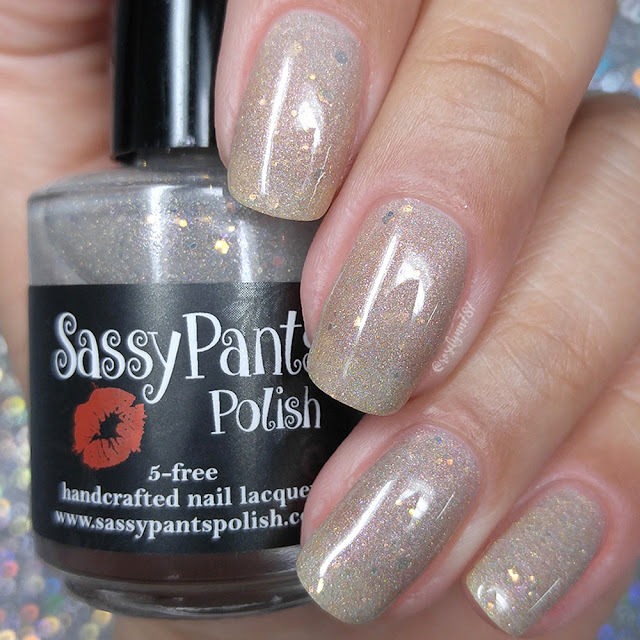 To recap, New England Christmas by Sassy Pants Polish will be available for purchase through the Polish Pickup Shop Friday, December 1st at 11AM EST through December 4th. This full-size 15mL shade will retail for $12 each. Be sure to join the Facebook group Polish Pickup Pack for more details and also check out the other makers involved for the month of December! This is beautiful for the Christmas season!